The Equator divides the Earth into Northern and Southern hemispheres. The hemispheres are in many ways opposites. They have reverse prevailing winds, ocean currents, direction of storm rotation, apparent path of the sun, and seasons from one another. Even the stars in the night sky are different. But when all that is put aside, distance from the Equator (in either hemisphere) is also a critical factor effecting climate, culture, and more. Northern and Southern biomes often mirror each other. For instance, hot deserts mostly exist between 30° and 50° north and south, and tropical rainforests between 0° and 10° north and south of the Equator. While there are strikingly few species that span both hemispheres outside of the tropics, there are many analogs. The South has penguins and the North has auks. The tallest tree in the South, the eucalyptus, and the tallest tree in the North, the sequoia, both live about 40° from the Equator. In this sense, the hemispheres provide a fascinating laboratory of different ways life has adapted to similar climes, like separate worlds sharing the same planet. The map of at the top of this article is an equal-area Gall-Peters map which takes all the land in the Southern Hemisphere (except Antarctica) and drops it in the oceans of the Northern Hemisphere. Relative latitude is preserved, but the landmasses are placed at random meridians. 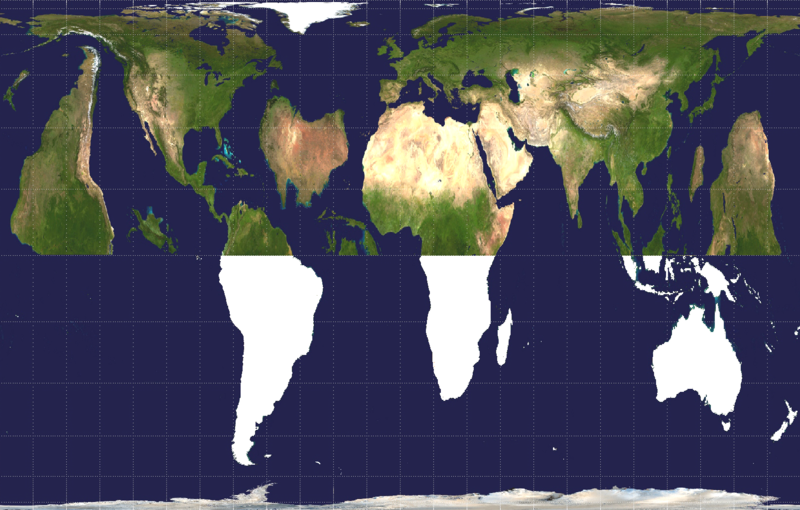 Since land makes up only about 29% of the Earth’s surface, it could easily be rearranged to fit into one hemisphere. Seen like this, our planet seems smaller, and its most distant lands suddenly appear at eye level. The map below preserves both longitude and relative latitude, showing where landmasses in the North and South would overlap if they shared the same hemisphere. Africa spans 72 degree of latitude, more than any other continent, and Durban and Cairo appear to overlap at the continent’s extremes. Kalgoorie, Australia overlaps with Shanghai, China, and New Haven, USA finds its match with Puerto Montt, Chile. Comparative Latitudes maps by Jordan Engel can be reused under the Decolonial Media License 0.1. Thanks! That was referring to the map at the top of the page. We’ve edited it to be more clear.